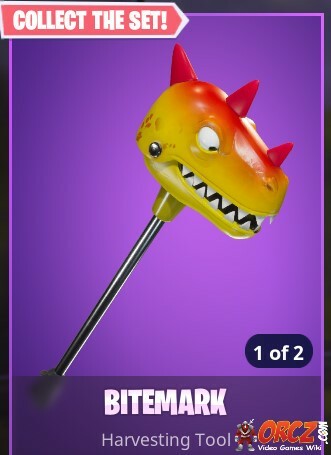 Bitemark Pickaxe in Fortnite BR. You can buy it from the Cash Store for 1200 vbucks. Bitemark is the name of one of the Pickaxe Skins in Fortnite Battle Royale. "Take a bite out of the competition." Bitemark's first appearance in the Item Shop was on April 19th, 2018 in the Featured section. Unlike most other Epic Harvesting Tools that cost 1,500 v-bucks, The Bitemark skin costs only 1,200 v-bucks.